Discover your new favorite local makers at a two­ day indoor shopping and creating experience, showcasing over 100 handmade and local businesses. August 26th and August 27th, made. 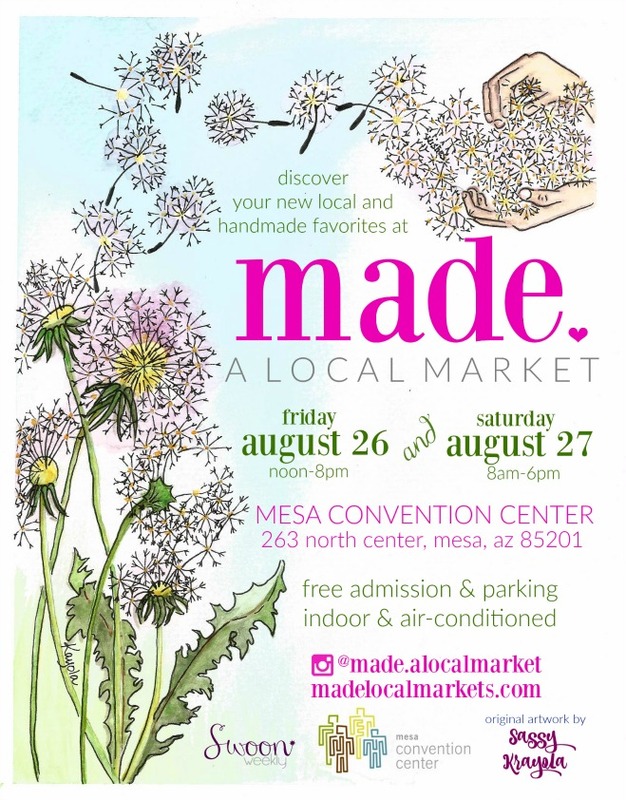 a local market will showcase local food, home decor, artists, apparel, bath and body, jewelry, and baby and kids items, all from businesses homegrown here in Arizona. Admission and parking are free, but if you want first dibs on the best the market has to offer, early entry can be purchased at the door starting at 10am for just $5. Doors close at 8pm on Friday night and 6pm on Saturday night, but you are welcome to shop through the market once they’re closed. Our market is staffed by our makers, who are eager to meet you and chat with you about what they do. If you’re interested in doing a little more than chatting, register for one of our hands­-on workshops taking place right inside the market, hosted by local artists and creatives! Hand Lettered Design is offering an Intro To Hand Lettering Workshop at 11am on Saturday the 27th. You can create your own masterpiece with local DIY bloggers from Lolly Jane on Friday morning at 10:30am (early entry included). Want to shop while your children try out a new dance studio? Beehive Dance Studio will be doing free jazz, hip hop and tumbling workshops on Saturday, ages 3­8 from 2­3pm and ages 8 and up from 3­-4pm. Create a dream board and get your empowerment on with The Zen Bird Friday evening from 7-8pm, perfect for a girls night or date night! All of these workshops and more can be found and registered for in advance (quickly! Before they sell­out!) at madelocalmarkets.com. As you enter our market, be sure not to miss our dandelion wish fence. Write your own wish and contribute it to the fence, then see if it comes true! Stop and take a picture at our photobooth and use the hashtag #mademywish to show your friends just how much fun it can be to shop local. The market and our makers will be working together to see how many of these wishes we can make come true. made. a local market is the brainchild of Shesten Melder and Tawnya Hansen. They both grew up and live in Mesa, where they met in junior high, and have a deep love for their local makers and community. We are also thankful to be sponsored by KIND, whose mission is to spread and celebrate kindness. The first 1,000 visitors will receive a free snack bar, courtesy of KIND.